LEARN HOW TO IMPROVISE COMEDIC THEATRE AND HAVE A LAUGH WITH FRIENDLY, LIKE-MINDED PEOPLE. "It's like playtime for adults!" In each of these weekly drop-ins you’ll be guided through a core element of improvisational comedy in a friendly and supportive environment. But most importantly, you'll have a laugh! You don’t need to be an Oscar winner to join us, in fact you don't need any acting, improv or comedy experience at all. The workshops focus on exercises and games to develop our teamwork and listening skills which easily lead you into creating entertaining scenes and characters! Each week is something completely different and exciting! One week we'll be creating and exploring character, the next week we might be practicing how to improvise a narrative and then the next week we'll do the whole workshop in mime. The workshops usually consist of silly ice-breaker warm ups, exercises to learn new skills and lots of time to play scenes and practise what we’ve learnt. All our workshops are open to absolutely anyone (over 17)! Improv is the perfect skill to develop if you are an actor looking to enhance your skill set, a writer looking for inspiration or anyone looking to unwind after work and gain a better understanding of creative collaboration. Please arrive from 7.50pm so we can start bang on 8pm. The Archway Theatre Studio, The Drive, Horley. It's directly underneath Horley Train Station and there's plenty of parking on the roads nearby. £5. You may bring this in cash on the evening or guarantee your place by booking online here. 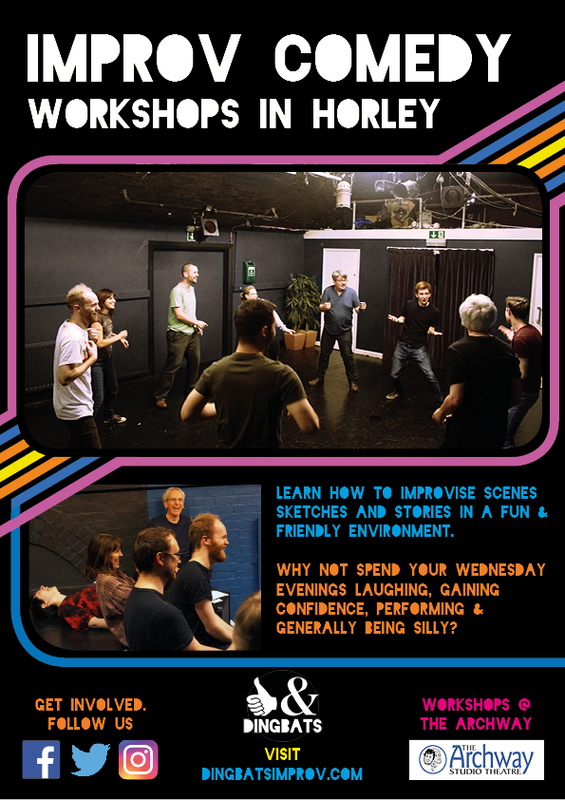 If you enjoyed your first Dingbats Horley Workshop then, to come to any classes thereafter, you must become a Club Member of the Archway Theatre (the kind people who let us use their Studio). It’s only £10 for the year and you receive a discount off all their main house shows.